Sending warm wishes and holiday greetings couldn't be easier. 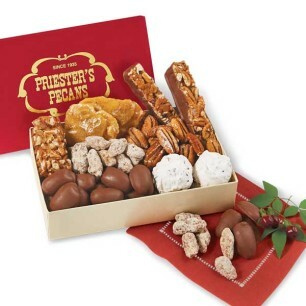 We fill this festive gift box with Roasted & Salted Pecans, Pecan Logs, Frosted Pecans, Milk Chocolate Covered Pecans, and Praline Pecans, individually bagged for freshness and ready to open and serve at the office or at your holiday party. 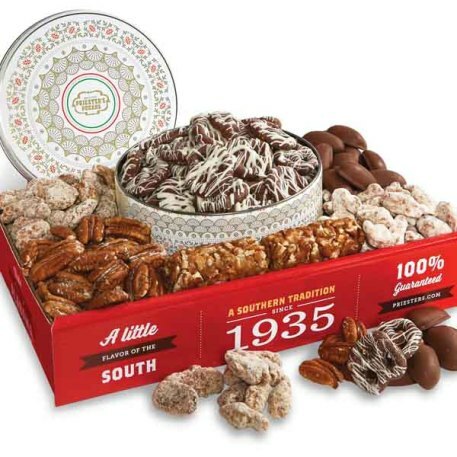 The Vintage Inspired Tin front and center is filled with fresh dipped Milk Chocolate Covered Pretzels. Excellent service!! Everything arrived on time and was fresh and yummy. Thanks again! 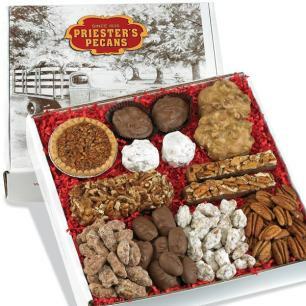 We all know Priesters pecans are deeeelicious...and it is always nice to know when you place an order and specify a preferred date for deliveries (across the country) they are always "spot-on" fir those dates. This is great..do your shopping a month early and Priesters ships them to arrive ON your designated date. Recipients are always pleased with their gift! 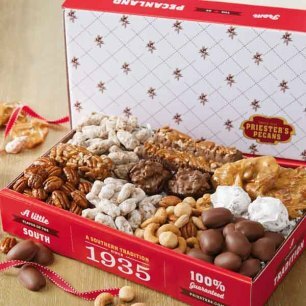 I sent this as a Christmas Gift to our family in Florida and they loved it! They enjoyed the variety. 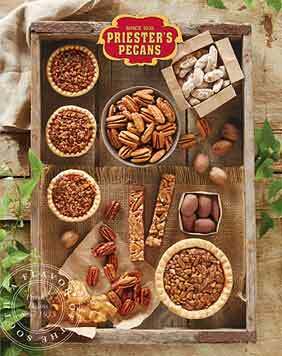 Would definitely use Priester's again!